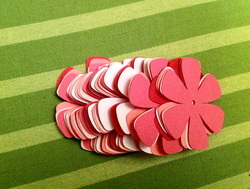 Petal Packs come with Fifty, 2.5 inch, high quality, card stock cut flowers. Pick from a combo color pack or you may place an order for custom colors and/or size . Custom sizes: .5 inches up to 12 inches. Sizes adjustments $ 3 + $ .50 per inch.